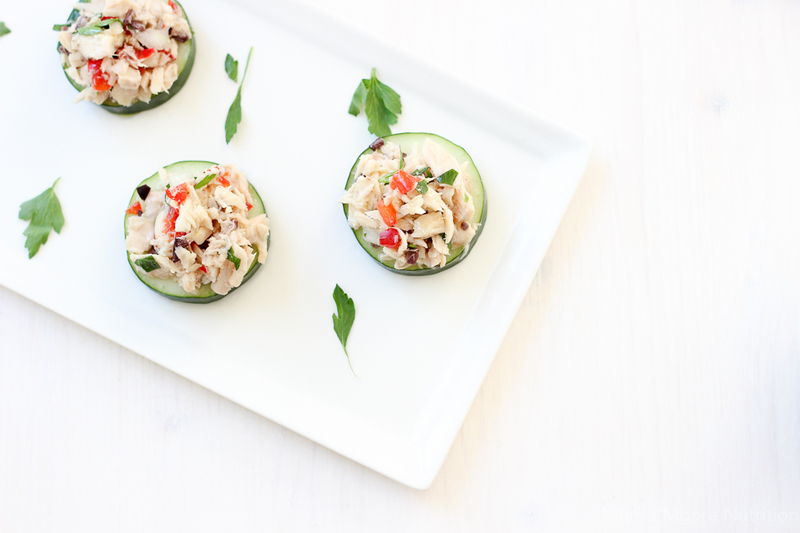 These Mediterranean Tuna Salad Bites make a tasty protein-packed snack or appetizer that comes together in under 10 minutes. Happy Summer, y’all! It’s time for a new recipe redux recipe. 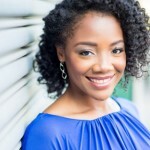 This one is inspired by fellow Atlanta registered dietitians, Ann and Lesley over at MyMenuPal, the place to go for healthy menu planning made simple. As I scrolled through Instagram last month, I stopped at their eye catching Avocado Chicken Salad in a Cucumber Cup recipe. When charged with this month’s recipe redux challenge to highlight another member of the group, this stunning photo came to mind and I was inspired to create a similar cucumber appetizer. Plus – It’s easy. And as I finish out this month with two more trips, easy is very necessary. These Greek Tuna Salad Bites combine the traditional flavors of a Greek salad with tuna for a protein-rich snack or appetizer. It’s a forgiving recipe that I made up on the fly using prepped chopped onions and peppers in the fridge. I also had some leftover olives from the supermarket olive bar so tossed those in. I love getting the flavors of Greek salad in one convenient little bite! These Mediterranean style Tuna Salad Bites make a tasty protein-packed snack or appetizer that comes together in under 10 minutes. Slice the cucumber into rounds. (I prefer to leave the skin on for color, fiber and to make it easier to hold the appetizer.) Set aside. In a medium bowl, use a fork to combine the remaining ingredients. Mix well. 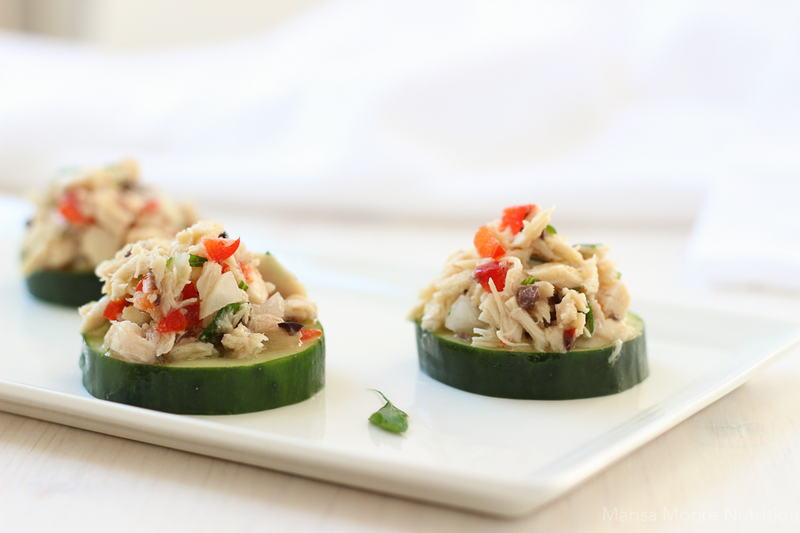 Place 1 heaping spoonful of tuna salad onto each of the cucumber rounds. 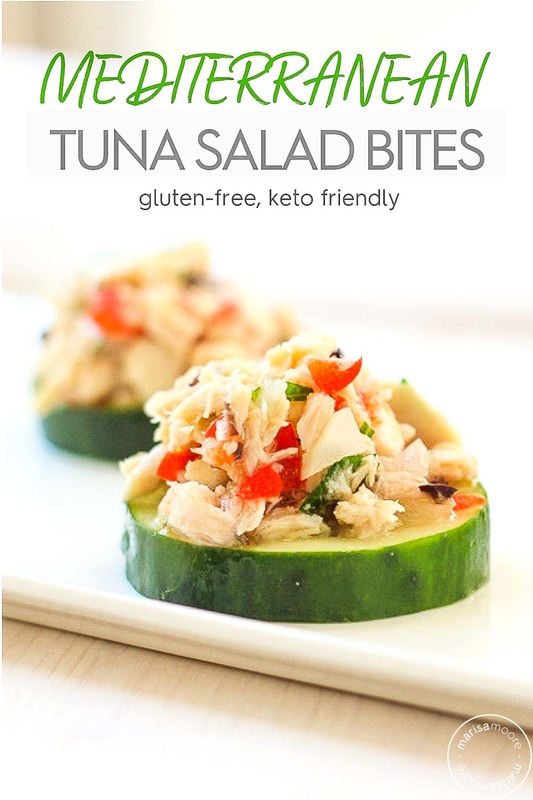 Enjoy these Greek Tuna Salad bites as a snack or an appetizer for a party.